Faith Hill. Women want to be her (or be her friend) and men want to, well…you know. And, that’s pretty much the definition of success as a female. Plus, she loves football. Which makes me want to be friends with her even more! For six seasons, we waited all day for Sunday night…when Faith hit the stage with her long legs and short skirts and belted out the tune to NBC’s Sunday Night Football. She put us in the mood for the big game, and judging by Twitter…much more. NBC Television seeks beautiful southern girl who can sing. In a very short skirt. Must love football. 1) Pink. Not southern. And too tattooed. 2) Britney Spears. From the South. But no longer from this planet. 3) Jennifer Lopez. Over JLo. Even if she is part owner of the Dolphins. 4) Taylor Swift. I don’t want to hear about her latest breakup. Not during football. Or ever. 5) Jessica Simpson. Getting warmer. In the meantime, Faith…call me! This entry was posted in NFL, Sunday Night Football and tagged Faith Hill, NBC. We live in a world where information is delivered to us immediately, continuously, in many different forms, and on many different fronts. It is quick, easy, and free to be informed on what is happening in our neighborhood and across the globe. The whole wide world has become our backyard…and it gets smaller every day. Which is why NBC’s decision to tape delay the major events of the 2012 Olympic Games will go down in history as one small backwards step for viewers, and one giant leap for the network…into obscurity. It is a perfect demonstration of what many have said, that the mainstream media is arrogant, out of touch, and fearful of the changing world and its role in it. It used to be that watching the Olympics meant avoiding the evening news so as not to know the major events of the day. That grew harder to do with cable television and 24-hour news. The Internet made it even more of a challenge, but with social media such as Facebook and Twitter now at the center of our lives, it is not only impossible, but ridiculous to even suggest to do so. Viewers in the United States saw tweets, viewed Facebook posts, and read Internet updates describing live, minute by minute updates of the opening ceremonies, while being forced to watch them hours later and after the fact. While the world joined together…we waited. 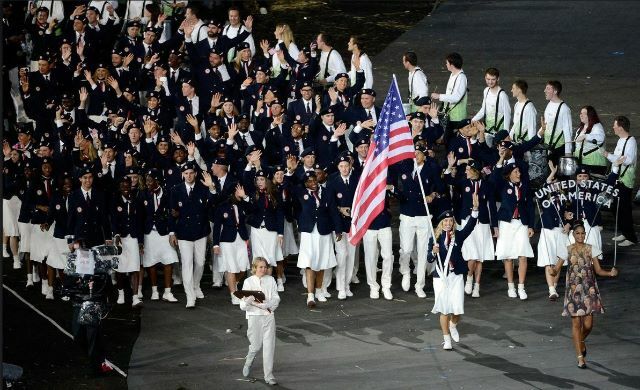 When Team U.S.A. marched out in pride…we waited. 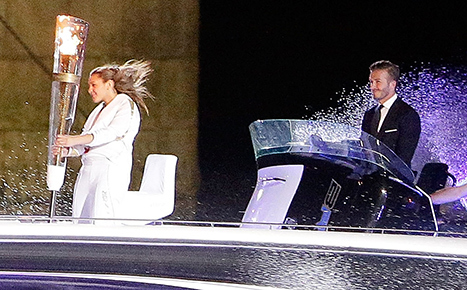 When David Beckham wore a suit and drove a speedboat up the River Thames carrying the Olympic torch (my favorite part personally)…we waited. And when the Queen officially declared the 2012 London Olympic Games open…we were still waiting. And waiting. And waiting. All the while, seeing and reading about the celebration taking place in the rest of the world. We were invited. But we were left out. In the dark. By our network, NBC. I’m sure we weren’t alone. There were probably other Olympic fans forced to watch an edited version of the opening ceremonies. In China. And North Korea. But this is the U.S.A. Where liberty and freedom ring. We declared our independence from England for freedom of religion and a free press. And now that press is going to tell us when (and how) we watch America’s games? The world’s games? I don’t think so. What makes NBC think they can pull this over on us? We are home of the brave and the free. And the iPhone. It’s time to take our country back. Starting with the Olympic Games. These are our games. And no one is going to tell us how we watch them. Not the Queen…and not NBC. This entry was posted in Olympics and tagged NBC.